The U.S. Air Force was officially created in 1947. The red-bar roundel was used by the US Army prior to the creation of the USAF. 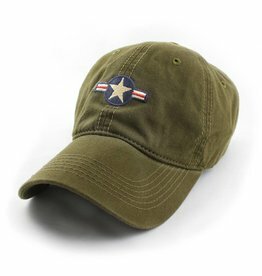 Embroidered on the front of a mineral-washed ball cap is the red-bar roundel. The back embroidery is a B29 bombing craft.